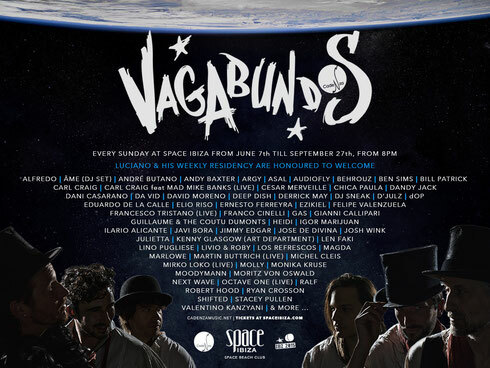 Luciano recently released the official line-up for the first season of Vagabundos at Space Ibiza, with more than 60 artists performing from Sunday 7 June until Sunday 27 September. The German duo Âme (DJSet), Audiofly, Ben Sims, French dOP (Live), veteran Josh Wink, Kenny Glasgow (Art Department), Berghain resident Len Faki, Livio & Roby, Martin Buttrich, DJ Sneak and American Stacey Pullen, are just a few from the confirmed line-up. Luciano will play along with talents from his label and agency Aether Artists such as Argy, Cesar Merveille, Dandy Jack, Eduardo De La Calle, Ernesto Ferreyra, Ezikiel, Felipe Valenzuela, Franco Cinelli, Gianni Callipari, Julietta, Michel Cleis and Valentino Kanzyani. The Main Room will be controlled by Detroit Love, Carl Craig’s primary music concept, on 14 June, 12 July, 9 August and 6 September. Mad Mike Banks (Live), Derrick May, Magda, Heidi, Jimmy Edgar, Moodymann, Octave One (Live) and Robert Hood, among others, will showcase their love for Detroit. Additionally, Deep Dish will take control of the Main Room on 23 August and 13 September for what’s going to be their only two Ibiza appearances. Californian label Next Wave and Italy’s Cocoricò will join the ranks too. Other DJs such as Space Ibiza resident Javi Bora, Alfredo, Andy Baxter, Behrouz, Ilario Alicante, Monica Kruse, and more artists to be confirmed, will complete the line-up.